These resources are only starting points. They represent a fraction of the research I’ve read and that I talk about when delivering a talk at a conference or school. If you’re interested in that, please see my Speaking area here. If you are looking for the articles I write for my site, on this and other topics, click here. MY CLASSROOM RESOURCES: my quality materials, Brain Sticks and Stress Well for Schools provide a comprehensive way to teach wellbeing management to people of all ages. I promote a clear, current, scientific and evidence-based understanding of what makes adolescence “special”, somewhat different from both childhood and adulthood. Adolescence means “becoming adult” and important changes enable that transition. It’s a natural, positive, temporary (!) and biologically-driven stage, which is, of course, affected by culture and environment but is not caused by them. Of course, teenagers are also humans just like the rest of us. Also, of course, they are different from each other: some go through adolescence more easily than others. But the science is clear (and my work covers this): a set of experiences, behaviours, chemical and brain changes happen during this period, which are identifiable as natural features of adolescence, despite individual and cultural differences. We accept that certain things happen in brain development, making newborn babies different from toddlers, and toddlers different from nine year olds; similarly, development in adolescence, usually starting between 10 and 12, sees the brain mature into a state in which independence can eventually happen. It’s a good thing! It helps to understand some of the details of this. It helps adults who live and work with teenagers and it helps teenagers themselves. My book, Blame My Brain, has been enormously popular in many countries around the world, both with adults and the teenagers for whom it was written. 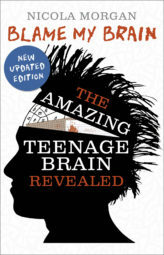 My own book, Blame My Brain – the Amazing Teenage Brain Revealed, was first published in 2005 and has been updated twice since. It is widely read all over the world, not only by the teenagers it was written for, but by parents, teachers and other professionals. 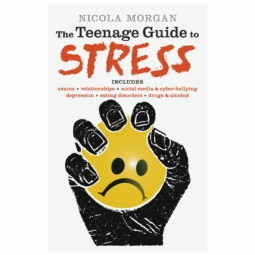 It is recommended on reading lists at universities and on teaching and social work courses, and by schools, and is one of the UK’s Books on Prescription, along with The Teenage Guide to Stress. Below is some of the research on which it is based. There is now an enormous body of work from around the world showing many ways in which brains change during adolescence. 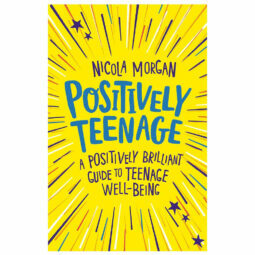 My later book, Positively Teenage, is much broader, covering not only brain changes but all the social changes that make life different for 10-18 year-olds compared to children and adults. It promotes a positive view of adolescence and is empowering and reassuring. I have a special place for Positively Teenage resources here. Are teenagers more stressed than adults? Impossible to say and pointless to try to measure. Adults have some different stresses – but we should have learnt good techniques so that we don’t suffer from stress. That is where my story comes in: I was a stress-suffering teenager and adult until well into my forties, losing time and energy to stress-related illnesses. I was not coping. Now, I’m exactly the same sensitive, introvert, perfectionist, ambitious, afraid-of-failure and anxiety-prone person, but I do not suffer from stress. I have stress but I don’t suffer from it: in fact, I welcome it. What happened? I learnt some things about stress, changed some behaviours and now have a strong system of preventing becoming ill. That’s what I want to share with people of all ages and I’m focusing on teenagers because I want them to have the knowledge that I lacked. My classroom resources, Brain Sticks, contain a section on teenage brain changes and this would be the ideal way to teach this to young people. Brain Sticks also include a mass of material about teenage wellbeing and stress and how to make our brains work best. Stress Well for Schools is the perfect way for school to teach teenagers about stress. These sites have extensive, quality advice on a range of topics. Getting the best possible sleep is extremely important for almost every aspect of mental health and physical wellbeing, including performance and function at work/school. So, we have to do what we can to improve sleep – ours and theirs. Luckily, there are really simple things that will help and none of them involve taking medication. You’ll find the start of that good advice below, under Sleep Hygiene”. You will also find a Tips For Sleep sheet in the “Additional” part of my Resources section. Have light snack if hungry; avoid added sugar/caffeine; try herbal tea, especially with chamomile, passiflora, fennel, liquorice. Switch computer and all electronic gadgets off; put phone downstairs. Dim the lights and close curtains in bedroom. Play slow and soft music. Spend 5 minutes tidying room – hooray! Or at least tidy desk or clothes. Spend 5 minutes getting tomorrow’s schoolbag ready or make list. Have bath or shower – use lavender oil? ** – and do teeth. Read (for pleasure, not work) and/or listen to slow, quiet music; writing is also fine. **Smell is a strong brain trigger – the very act of smelling particular scent every night before sleep could trigger brain to feel sleepy. Phones – as well as the light, they bring messages likely to excite, not relax! Arguments/stress – another reason to remove phones/internet from bedroom. I hope you have found this selection of resources useful. Remember they are only starting points and there are many articles and resources in the rest of my website, my books and classroom resources. Do ask me to come and speak to your audience: See the Speaking section of my website.